They say that practice makes perfect and if it doesn't do that, it certainly gives you lots of opportunity for repetition. 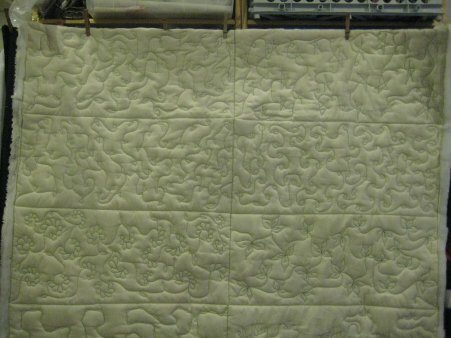 Back in April 2006, I became the proud owner of a Tin Lizzie longarm quilting machine. This was one of the first versions that came off the assembly line and although new models have since been made, my model of Lizzie is more than sufficient for my needs. I am not an award-winning quilter. My quilting doesn't inspire people to stop and take pictures. And it certainly doesn't engender anyone's jaw to drop in awesome wonder. BUT ... it holds my quilts together in a decorative fashion and I'm happy with it. I had lots and lots and LOTS of tops to quilt, most of them bed-sized. A bed-sized top is just a humungous amount of real estate to cover for a neophyte quilter. So, I pieced some (much) smaller charity tops; quick and easy and not very inspiring ... but they did give me practice in loading the quilts, learning my way around Lizzie and the mechanics of quilting. Thinking up a design to quilt is another quandry. 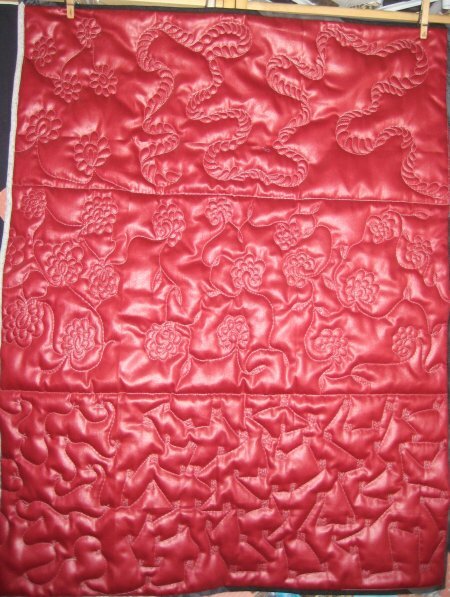 My quilting isn't very imaginative: generally speaking, I don't have a clue what to quilt! .... WHERE oh where do people get their ideas? I'm simply dismal at anything original. I look at quilts on the internet, take pictures of interesting quilting at shows and look at books. But when it comes time to really do the quilting, I am simply stuck. Anyway, it wasn't until recently that I became aware of a set of 3 books by Darlene Epp, "Pocket Guide to Freehanding". A little on the pricey side, I gulped as I plunked down my credit card number and ordered it. When it arrived, I eagerly thumbed through them. Man, I wish I knew about these books *years* ago. Wow. Oh. My. Goodness. Wow. HERE is what everyone else was quilting! HERE are the designs and motifs that I've seen on other quilts. While it's nice to have a starting point when you see samples of quilts online and at shows, sometimes it doesn't really help YOU out with your OWN quilt. 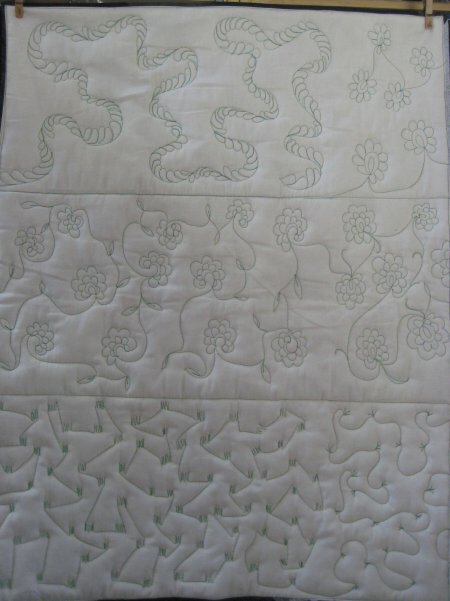 As nice as those sources are, it was always a stumbling block to me to think of WHAT TO QUILT. Darlene's books start you out with very basic designs and build on them, step by step, until you are creating FREE MOTION some very intricate and wonderful designs. So, I would load up some inexpensive fabric and doodle Darlene's designs. However, I don't really need the quilted doodlings when I'm done. Yes, I can see where they would be a good physical reference to look at, but I just don't have the SPACE to store the doodle cloths. Besides, Darlene's books give wonderful diagrams and I can look at them instead of the doodle cloths. Several months ago, I had been chatting with our cats' veterinarian and was told that they would LOVE LOVE LOVE my doodle cloths as cage liners for the animals to lie on. The staff use towels but one-piece quilted cage liners sized at 27"x36" to fit the cages would certainly be nicer for the animals. I found 3 rolls of a small amount of home dec fabric at a thrift store; they would be *perfect* for the backing. I loaded a home dec backing fabric, a thick batting (a purchasing mistake on my part) and muslin as my top. For my first effort, I wasn't thinking too clearly on the intended final product but rather just practicing some quilting motifs. 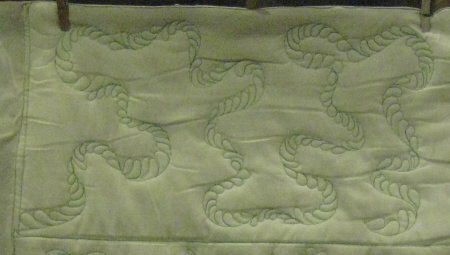 I did a clamshell filler that I had found directions for on the internet (later, I would discover this same motif in Darlene's books). The clamshells came out fairly nicely. I discovered that this fill compresses the batting substantially. At a quilt show some years ago, I purchased some spiral templates. They looked SO wonderful at the show! However, after giving them the ol' college try many times, I *still* am unable to trace the edge of the spiral template nicely. ::sigh:: ah well. More practice is needed. 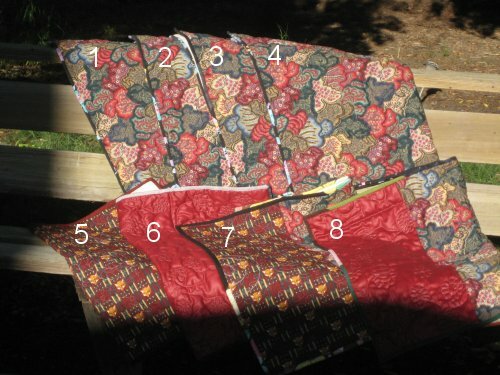 And in between the clamshell and spirals, I squeezed some of the first quilting designs from Darlene's book. It produced the requisite cage liner but really didn't give me the prolonged practice I should have had. After loading the next piece of home dec fabric, I sectioned it into 12"x 27" sections ... since the cage liners are 27"x36", (3) 12" sections would make a cage liner. 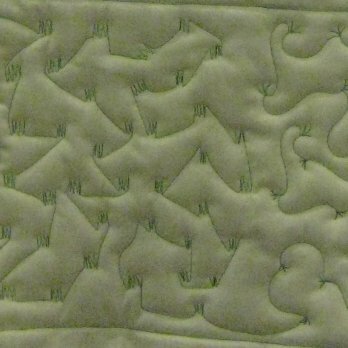 I used each section to do a new quilting motif. This was much, much better. The home dec fabric was about 58" wide, so I could get (2) 12"x27" sections across Lizzie's workspace. I now had a clearly defined area to doodle in. Wow ... it looked great! I have to admit, I was doggone pleased as punch with my efforts ... the feather meander looked wonderful! The hardest design, for me, was the 'tufts of grass' .. specifically because this design was angular, not curvy. One of the home dec fabrics was an incredibly luscious cotton sateen. It had the most lustrous sheen to it. I doodled the inside feather meander, a version of a rose, and the tufts of grass. When I looked at the sateen (back) side, I was astonished. 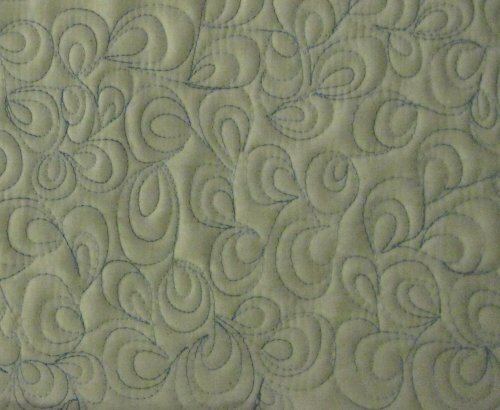 The heavier quilting of the feather meander and roses really smooshed the batting down and the unquilted areas around it were quite poofy. Very, very textural and visually interesting. I was additionally surprised to see that the sheen held up through laundering. You won't get this kind of poofy if you use a lower loft batting, though. 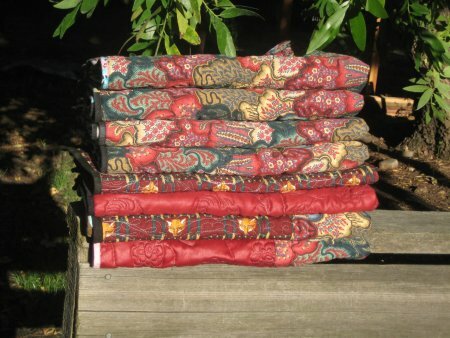 I finally used up my home dec fabric and was able to make 8 cage liners from it. They've all been washed & dried .. and ready to be delivered to the vet's.